Beautiful products attract attention. People want to know how they work. Feel how they feel. And they can... in the Aquademie in Schiltach in the Black Forest. Take a stroll through our showroom and discover fun and exciting facts about the resource of water. Use our test showers in the hansgrohe Showerworld or the shower truck. Alternatively, visit a dealer near you to view our range. Wherever you find us, there is one thing you should know: the hansgrohe virus is extremely contagious. You may find that you want one or more products. Immediately. We accept no responsibility for this risk. The contemporary washhouse: at festivals, sporting events and cultural events, showers are now taken in a shower truck. The bookable hansgrohe sanitation facilities provide fun with water on the road. 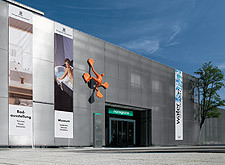 View and touch our products in the Hansgrohe water world at the company’s head office and discover the entire spectrum of bathroom culture – from the middle ages to the present day. 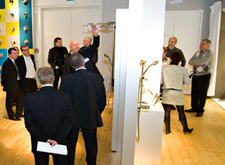 hansgrohe products can be experienced live at many events. You can also experience and test hansgrohe in your city: in a sanitary dealership near you. We will not only provide you with professional advice but also ensure that your installation is correctly fitted.